The book club says bon voyage to Concord and bonjour to France! The ending of a wonderful book series is always a bittersweet thing. Actually, often more bitter than sweet. 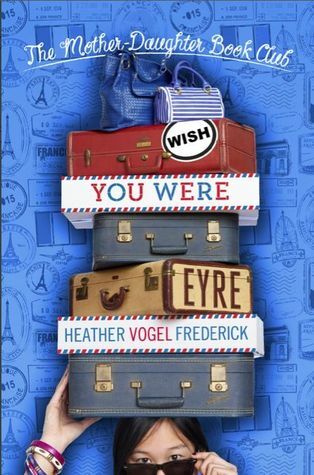 Wish You Were Eyre is the sixth and final book of Heather Vogel Frederick's wonderful Mother Daughter Book Club series. When the series began, the four girls in the book club, Emma, Cassidy, Jess, and Megan, were in the sixth grade. Now, they are sixteen years old and have added a fifth member to the book club, Becca, their former frenemy. It's rare and wonderful to see a book centering on sixteen year olds innocent enough to be read by middle grade readers. The cleanliness and relatively innocent dramas of the girls' lives is more representative of a lot of sixteen year olds' lives than the risque, edgy YA books that are so prevalent. Each of the Mother Daughter Book Club books focuses on a different story that the club has chosen to read over the course of a year. The plot also vaguely follows the book's. Sometimes, the book has more influence than others. Jane Eyre is the focus of this novel and the connection between the plots is pretty light. That's fine with me. I was much more interested in saying goodbye to girls I'd known for six books than seeing their lives twisted to fit the plot of a book. What sets this series apart from so many others is the amount of mistakes our heroines make. It's not that they are messed up people, but rather they are very human. This includes the moms as well as the daughters. In Wish You Were Eyre, the girls are judgmental, jealous, and mean towards a foreign exchange student who moves in with Megan. You also have a lot of insecurity about boyfriends and various petty feuds. This can be frustrating to read at times. I wanted to shake the girls for being such idiots. But I love how the author shows that characters who are indeed delightful people can also be real jerks at times. Because isn't that so representative of life - high school especially? Wish You Were Eyre isn't my favorite of the Mother Daughter Book Club series, but it still ends the series on a strong note. If you like books featuring strong but human characters with a wide variety of personality types, that emphasize a love for reading, and that always have a strong message, you really should read The Mother Daughter Book Club. Although advertised as a middle grade read, it doesn't feel too juvenile for an adult or older teen to read. I love The Mother Daughter Book Club and I miss it. First off, love the cover. Adorbs! I still haven't read any of this series but I mean to! Maybe I won't start with this one, though I do love that they're reading Jane Eyre. Never heard of this series. I'll have to check it out. Thanks for the lovely review. I have never heard of this series before. I'm going to recommend it to my sister in law to read with there daughters. Sounds adorable. I read the first in the series but I haven't got the rest yet. This one definitely sounds good though. And I love the covers! I really like this series; I was actually round about the same ages as the girls as I read them so in a sense I grew up with them. I found the ending of this one to be a little too perfect but thought it was a light, fun read.